I grew up as a middle child in an “almost all” hearing family (with one sister being hard-of-hearing and primarily as the spoken-language user). I had a paternal deaf uncle, so it is by default that my being Deaf is hereditary. My education began at the Indiana School for the Deaf at age 4 (1963-1979) which contained early auditory and spoken communication at the primary years, and then a mixture of Total Communication and basic American Sign Language (ASL) during the middle-high school years. During my social-emotional development and growth with Deaf peers, American Sign Language was the primary modality. However, when it came to playing with my siblings, neighbors and cousins, it was gesturing, lipreading, and simple spoken communicating. I still remember fondly the many playtime activities in the backyard, street, park, and vacation sites—experiencing and observing those essential life skills, even though I had very limited inkling of what the conversation was. I was quite an observer, and it still holds true today. In addition, my experiences in the dynamic of family structure within my family and others’ sparked my curiosity in the whys and hows such decisions were made. While I was at Gallaudet University as a first-year college student, I was tapped to consider taking the role as the peer advisor (to guide new students the following three years) and since then, it sparked my interest in studying personal growth, human development and counseling, thus a Master’s degree in School Counseling with Deaf Students from Gallaudet University in 1988. Subsequently, I became a parent of our firstborn son, RJ, who dealt with eye cancer as an infant, becoming blind, and gradually became deaf. This initial journey raised my consciousness and passion on the importance of sensitivity and support for new parents’ journey in being an empowered and loving parent for their deaf (and blind) child. 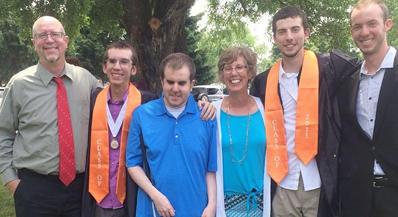 My husband, Rusty and I have four sons—two are Deaf, one is Blind and Deaf, and one is Deaf and unilaterally blind. Communication slightly differs within this family, though. RJ’s primary communication mode is through Braille and Spoken English (through audition and tactile signing). The rest of us in the family use ASL. I have been providing a variety of family-support services since early 1989, beginning as the Staff Therapist for a local mental-health agency in Indianapolis. At that time, the agency had just started the Deaf Services to fill the gap of serving deaf people (and their families). My instinct was to take on a caseload of deaf children with their parents and siblings in sessions. Gradually, I worked at the Indiana School for the Deaf in several counseling-related roles (guidance, school, and early intervention). In 2013, the Indiana’s House Enrolled Act authorized that a Center of Deaf and Hard of Hearing Education (Service) be established [replacing the Outreach Services], so I seized the opportunity to cease working full-time and do part-time contractual work, which I continue to do this day, in my role as a parent advisor (recently discontinued this) and Deaf mentor with families who have deaf infants and toddlers. On top of this, I co-teach a summer course with Gallaudet University’s Deaf and Hard of Hearing Infants, Toddlers and Families: Collaboration and Leadership Interdisciplinary Graduate Certificate Program. In addition, since 2009 I’ve been very involved with the American Society for Deaf Children (ASDC), a family organization that is committed to empowering diverse families with deaf children and youth by embracing full access to language-rich environments through mentoring, advocacy, resources, and collaborative networks (www.deafchildren.org). I recently completed co-chairing the 2015 ASDC Conference, held in Indianapolis, which essentially was a huge success. Through my work with ASDC, it allows me to contribute my passion and belief into a variety of avenues, such as position papers, publications, presentations, and gatherings. Two of my proud key contributions were with the Joint Committee on Infant Hearing’s Supplement to the JCIH 2007 Position Statement (2013): “Principles and guidelines for early intervention after confirmation that a child is deaf or hard of hearing” (Pediatrics 131 (4). e1324 -e1349. doi: 10.1542/peds.2013-0008) and the chapter for the Resource Guide of the Early Hearing Detection and Intervention, called “Deaf Adults Connecting with Birth to Three Families” (http://www.infanthearing.org/ehdi-ebook/2015_ebook/19-Chapter19DeafAdultsConnecting2015.pdf). The process of creating both required very close attention to details and clearly communicating with the contributors (writers) and committee members while drafting the supplement (25 pages) and the chapter (ten pages), so that our (Deaf Community and parents) views were seen, included, validated, and carried forth during the early years of a Deaf child’s life. I wanted to be sure that the families had a sense of pride in raising their deaf babies and young children and the ‘sense’ would come from a community of supporters. Upon reflection, writing required careful consideration and thoughtful sharing of important points - which was a challenge for the JCIH paper, yet a much enjoyable one for the Resource Guide chapter. Currently, the JCIH members (of which I have been one of the three editors) are finalizing the JCIH 2015 Position Statement, which serves as an update to the JCIH 2007 Position Statement. Raising my oldest blind and deaf son, RJ, and then repeating the experience with my other son, Colton, was very important in my belief of the power of bonding and respecting a child’s individuality. A few strong memories came to mind: With RJ being totally blind as a baby due to retinoblastoma, a form of malignant eye cancer, the human touch, genuine bonding, and closeness is what sustained RJ’s navigating himself in this world. Also, when Colton came along and faced many medical treatments for his retinablastoma as well, my priority of being a partner in Colton’s medical care with the team provided more positive opportunities for healthy collaboration and confidence in my making decisions. Finally, being a firm believer of quality family time, my family and I ensure that each one of us in the family is ‘seen’ and ‘felt’ as an important individual and as a valuable member of the family. We do this by being together at dinnertime, having frequent conversations, playing together, and being each other’s greatest fan through academics and sports. If you were to ask my close friends and family members what my personality traits are — they would say: compassionate and sensitive — striving for healthy growth in others. These are obviously carried over to the families whom I serve as an early-education provider. Remembering my childhood that prompted my lifelong passion—plenty of playtime, sibling relationship, family rituals, summer vacations, dealing with creating complete access to communication, and trying to fit in, all of these encompassed how I collaborate the essential skills with the parents and family members. I love the purity and innocence of all babies - knowing they come to the world with a very open and clean view. I’m also a keen observer and sensitive, so I enjoy being a family educator through mentoring, teaching, writing, or presenting. One immediate specific role is being a Deaf Mentor and Trainer. The goal for these families with a Deaf Mentor is to appreciate the value and benefits of partnering with Deaf adults, to learn and comfortably use American Sign Language, become familiar with the Deaf Community, and meet many other Deaf people that best meet the family’s needs and goals. For this, I am passionate as a provider with the families. For the parent(s), their newborn baby is a new and exciting experience that is not provided with a “personal instruction manual.” When the baby is Deaf, a host of new learning experiences into the unfamiliar and unknown come in. Upon entry in Early Hearing Detection and Intervention (EHDI) programs, it is essential for families to be led to resources that can support their positive parenting journey with comprehensive information. Deaf people come from all walks of life, with their experiences that vary widely, based on their audiological, linguistic, cultural, education, and social-emotional experiences. Identity is fluid and changes throughout one’s development stages and family structures based on living outcomes and availability within reach of the support system of both the Deaf and hearing communities. So, a Deaf adult as a ‘specialist’ (deaf mentor, deaf role model, ASL specialist, and so forth) play a valuable role with the families. A chapter of this topic was recently posted in the EHDI’s Resource e-book, found here: http://www.infanthearing.org/ehdi-ebook/2015_ebook/19-Chapter19DeafAdultsConnecting2015.pdf. Through the Deaf Adult’s involvement, the family thrives in all aspects of development, such as language, cognition, and social-emotion health. I am content with having a good balance of being with my family, performing contractual work as the Deaf Mentor, staying invested with the ASDC (and participating within the committees that ASDC serves on), and teaching a course or two relating to family support with Gallaudet University. My youngest twin [are now] attending Gallaudet University as freshmen, so it’ll be a quieter home life, which may allow me a spark of something new with my passion. I have often toyed with the idea of writing a book, and of course . . .